The first workshop in 2016 will be on Saturday 30 April and Sunday 1 May. We are very fortunate to have Irene Blanck as our tutor . There are two class options, Clamshells or Miz Kelly. You can do one day or two, Irene is very flexible in her teaching, the aim is to have a fun time learning a new technique or perfecting techniques where there is some prior experience. For more information, contact the Judith, the Workshops Coordinator – details in your newsletter. 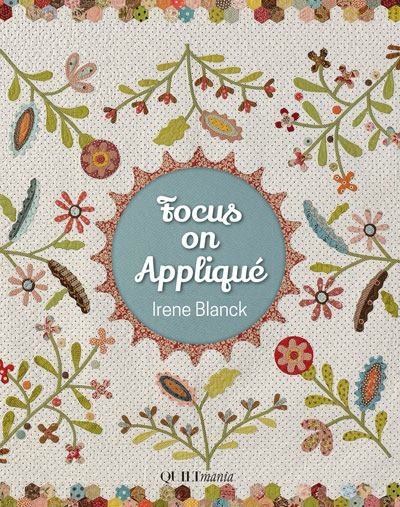 Irene’s book Focus on Appliqué was published by Quiltmania in 2015. It features many of her original designs inspired by traditional quilts and her love of needle turn appliqué. She went on a month long road trip to the US at the end of that year speaking to guilds and teaching her designs to enthusiastic students in many different states and at the Houston festival. You can read all about this trip on Irene’s Blog. Or spend some time viewing the gallery of her quilts. Certainly a lot of inspiration there. Irene will be our speaker at the Monthly Meeting in March, so you will be able to see her quilts in real life. Taking a workshop does not have to mean starting a big project. Many quilters use the class to try something new, like the fine stems and multilayer flowers in the Miz Kelly quilt or an efficient approach to Clamshells. The sample block may then become a cushion, or a bag, or a reference for another quilt of your own design. Enrolling in a workshop is not a commitment to making a whole quilt, but of course it can be. It is however an opportunity to spend time with an expert in these areas, to pick her brain, pick up lots of tips, get advice on colour and fabric choices. She is a sounding board for your ideas and you can get the benefit of her years of experience. This entry was posted in Workshops and tagged Irene Blanck, quilt workshop. Bookmark the permalink.